The Billionty-Oneth Geek: To The Moon!!! When I first saw the trailer for To the Moon, I was floored. Its 3 minute promo elicited more emotions in a game than anything I’ve played in the past 3 years. And it was a 16-bit RPG! From everything I saw, it was a win. But did it meet those fanboy expectations? In To the Moon, you “play” as two memory scientists who are part of a company called the Sigmund Corporation. The Sigmund Corporation specializes in diving into patient’s memories and changing their attitudes and aspirations by changing their memories. They are hired by a dying, elderly man named Johnny Wyles who’s one dream in life was to go to the moon. Our scientists travel back in time through his memories to find out more about this aspiration and make his dream come true – at least in memory. Through this journey back in time, we are taken through a drama that involves friendships, romance and relationships. 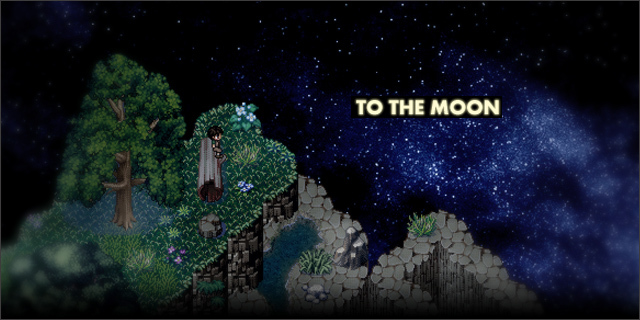 To the Moon is a storied experience developed by Freebird Games and released in the latter part of 2011. To call To the Moon a game would be a very loose and arguable statement. It is not really a game in the conventional sense. You’re never really challenged and there are no odds that you’re to overcome. It is more of a storytelling experience, under the guise of a 16-bit RPG. The experience is heavily authored. Those looking for an in-depth and challenging gaming experience need to turn away, this isn’t for you. Story here is the goal, not gameplay or mechanics. You move, point and click at things. Once in a blue moon, you need to solve a picture puzzle to progress further. That is pretty much the extent of gameplay. The vast majority of the game is watching characters and reading text. Early on in the game, it even teases the player that there might be combat (but there is none to be found). I’m at odds with how I feel about the experience. I mean, when I sit down to game, I want to game. When I want to read a book, I'll read a book. When I want to see a movie, I'll see a movie. I don’t know if I was bamboozled, but I didn’t get what I expected. But the story, although sort of Inception-y, was interesting. As a game though, I wanted more and unfortunately, there was not a hook. That said, the soundtrack is delightful, and to me, is probably the most memorable aspect about the game. For a game that spans around 4 hours, they do well in establishing a memorable theme that’s intertwined with the story as well. The soundtrack is a wonderful homage to the 16-bit era. For me, overall it was thumbs in the middle experience. I can’t give it a hard recommend, but if you’re curious enough with what the story is about, it wouldn’t hurt. I guess on the plus side, it’s only $10 (I got it for $8 on sale on Steam though!) and will only eat up 3-4 hours of your time. Til next time, later geeks.